Grab a lounger under the palms or find an umbrella if you've hit your sun quota for the day. Bring a GoPro - you never know what you'll see just below the surface. Dine poolside, timing it right to watch the sky turn orangey-pink. Step out onto your breezy balcony for the full effect. Work out without feeling rushed for once. Located on a beautiful beach overlooking Emerald Bay. Play a round at the 18-hole championship golf course adjacent to the resort. Visit the SeaStar Spa for an Elemis Spa Therapy. If you’re a fan of The Bachelor, this place may look pleasantly familiar. The award-winning Grand Isle Resort and Spa was recently featured on an episode from the show’s 20th Season. With good reason. This just-luxe-enough escape has perfected that casual elegance that makes an ideal beach getaway. 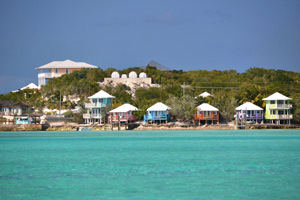 Grab a lounger surfside on a mile-long stretch of Great Exuma Island’s white sand beach, cooling off occasionally in the sparkling blue waters of Emerald Bay. Travel + Leisure named the Palapa Grill as one of the Bahamas’ “Best Romantic Restaurants” and SeaStar Spa among the “Top Spas.” Book them both early in the week so there’s still time for a return visit. Individually decorated one- to four-bedroom villas open out to private balconies or patios with breathtaking views out over the water, golf course and lush, tropical greenery. Gourmet kitchens invite you to venture beyond your usual go-to meals, try something more Caribbean-inspired (conch-anything will do). Save Tuesday night for the can’t-miss Bahamian BBQ with live entertainment, and Thursday for the Island BBQ and Junkanoo bonfire on the beach. Don’t miss the sport fishing, diving and snorkeling, or the chance to swim with local pigs – they’ll eat right out of your hands! - Guests that are planning to arrive after midnight must contact the property in advance using information on the booking confirmation to arrange check-in.